Biscotti and Bourbon - A recipe from Savor California, the online showcase for extraordinary gourmet foods and beverages from California. 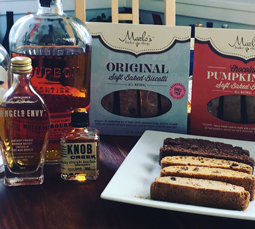 Marlo Gertz, founder and owner of Marlo's Bakeshop, highly recommends accompanying her Soft Baked Biscotti with Bourbon. Her favorite pairings with bourbon are the Original or Chocolate Pumpkin Pie.